Where to get tickets, where to park and where to eat. 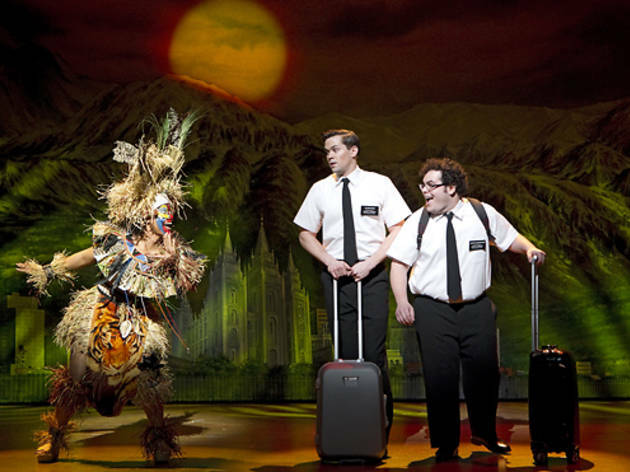 Check out our guide to your trip to see The Book of Mormon—where to get tickets, where to eat beforehand, where to park and more. Now through September 8, 2013, at Bank of America Theatre, 18 W Monroe St.
By the creators of South Park, this show is two and a half hours long with one 15-minute intermission. It's suitable for ages 18 and older. There's a limit of eight total tickets. Best availabilities are Tuesday and Wednesday evenings at 7:30pm and Wednesday matinees at 2pm. You can buy tickets at ticketmaster.com. Currently, there are a lot of single seats available for February. 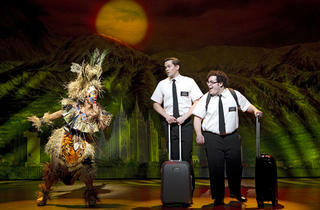 If you want seats in pairs or groups, they are more available in March or during February matinees. Give yourself plenty of time whether driving or using public transportation. Bus times and schedules vary so make sure to use a CTA tracker. Bank of America Theatre has a feature where you can reserve a spot in local garages ahead of time. Marshall Field’s–turned-Macy’s has brought celeb chef Rick Bayless into the fold with this food-court counter. You’ll find tortas, huaraches, quesadillas, tamales, salad and soup, all of which counter most fast-food notions. But we’re biggest fans of the torta Cubana, and all of its smoked pork loin and applewood bacon glory. At $7 for a creative Loop lunch, don’t be surprised if lines rival Frontera Grill’s queues. Owner Billy Lawless and chef Dirk Flanigan have a hit on their hands with this downtown gastropub. The whiskey list is lengthy, beer options reach beyond the basics, and wines are accompanied by clever, straightforward descriptions. Flanigan’s food is rich and aggressively flavorful, from the perfect-for-snacking Scotch egg to the Gage burger, served a juicy medium-rare and dripping with melted onion marmalade and gobs of stinky Midwestern Camembert. The restaurant from the chef and owners of the Gage is the most striking, most breathtakingly opulent restaurant to open in recent memory, a place where everything, from the huge crystal chandeliers to the gracious service, has been polished to perfection. In this sense, it’s a rather old-school restaurant, and the food follows suit: As if to prove he can do more than pub grub, chef Dirk Flanigan cooks dishes like duck consommé with duck-filled agnolotti, smoked steak tartare with potato chips, and a decadent bowl of housemade pappardelle topped with perfectly sweet morsels of lobster. Sometimes the food verges toward heavy, but it won’t, and shouldn't, stop you from eating. This tiny Euro-chic café bills itself as an organic carryout restaurant, but note that the word healthy is nowhere to be found. Warm, whole-grain pretzels—baked throughout the day on the premises—may indeed be good for you, and no doubt the organic salads are, too. Sandwiches, such as the Black Forest ham and Gruyère on soft “bretzel” bread, aren’t exactly unhealthy, either. But our doctor probably wouldn't condone our favorite part of the store: an entire wall dedicated to chocolate, stocking more than 250 different bars. A classy choice for the symphony set and couples looking to indulge, this institution proves excess is best. Slide into a cozy booth and start the assault with classic borscht, sour cream–slathered dumplings and caviar blini. Follow up with creamy beef Stroganoff or oniony, nutmeg-laced, ground beef–stuffed cabbage rolls. Finish up with hot farmer’s-cheese blintzes or Klara’s apricot-and-plum strudel, a family recipe. Be sure to order a flight of house-infused vodkas (horseradish, ginger, black currant tea, coriander and more). This nationally acclaimed small-plates spot looks like a sauna, has communal seating, doesn’t take reservations and is loud as hell. But it remains the must-eat spot for foodies in the know. Chef Erling Wu-Bower mostly sticks to the Mediterranean formula that original chef Koren Grieveson put into place (and has wisely held on to her most famous dishes, such as the chorizo-stuffed, bacon-wrapped dates and the taleggio-filled focaccia). Is his food a little more involved—a little less simple—than the avec of the past? Sure. But despite the extra elements in his intoxicating squid-ink pasta dishes, or the layered flavors in his salumi plates, Wu-Bower's food is still pure, delicious avec. Mike Sheerin is out as chef de cuisine of Blackbird; David Posey is in. What this means for the iconic West Loop restaurant is a change in style but with no fluctuation in excellence—in other words, this kitchen, overseen by chef Paul Kahan, is still one of Chicago's best. The beautiful, seasonal plates Posey puts out are full of surprising elements—caramelized egg yolk at the bottom of a garbanzo bean soup; tiny piles of caviar tucked under an octopus's tentacle—which makes for exciting, surprising and, sometimes, challenging eating. Patrick Fahy's pastry courses are much the same way (when's the last time you had parsnips for dessert?). But as nice as his desserts are, you'll nevertheless regret the moment when a meal here ends.